The Great Rift Valley Lodge is located on the edge of an Escarpment overlooking the Great Rift Valley and Lake Naivasha in the Nakuru region of Kenya. The Great Rift Valley Lodge is situated on the Eburu or escarpment on a mountain that local Maasai tribe call Ol Donyo Opurru or “mountain of smoke”. The lodge is situated at an altitude of 7000 feet meaning it has scenic views to the West and east all the way to Lake Naivasha to the volcanic crater of Mount Longonot and the fringe of the Aberdare Mountains. The Geat Rift Valley Lodge can also be reached by air. It takes about 3o minutes from Wilson Airport or Jomo Kenyatta International Airport to the lodge airstrip. 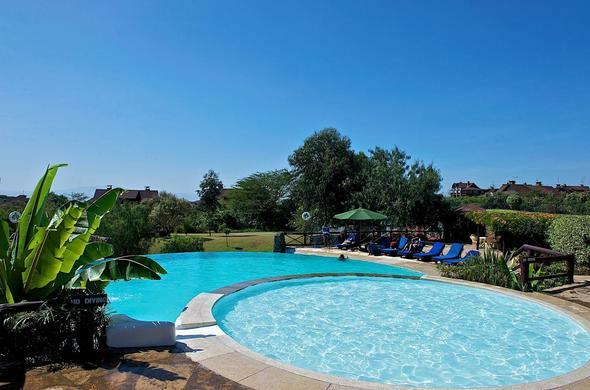 The Great Rift Valley Lodge is located just 12 kilometers off the Nairobi- Nakuru Highway on the edge of Ol Donyo Opurru, which is Masai for “Mountain of Smoke”. The journey from Nairobi takes about an hour and a half. Its location midway between the Samburu region and the Masai Mara makes the lodge the perfect stop over when travelling between Kenya’s great reserves. This Lake is a fresh water lake unlike many of the Rift Valley Lakes which are soda lakes. It is home to Hippo and many species of water fowl.